Geoff has over 38 years' direct experience in investment markets having held a variety of senior investment roles in Australia, the UK and the US. 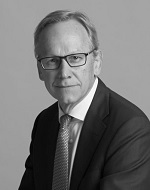 Geoff founded Wilson Asset Management in 1997. Geoff created Australia's first listed philanthropic wealth creation vehicles, the Future Generation companies. Geoff is currently Chairman of WAM Capital Limited, WAM Leaders Limited, WAM Research Limited, WAM Active Limited, WAM Microcap Limited, WAM Global Limited and the Australian Stockbrokers Foundation. He is the Founder and a Director of Future Generation Global Investment Company Limited and Future Generation Investment Company Limited and a Director of Australian Leaders Fund Limited, Global Value Fund Limited, 8IP Emerging Companies Limited, Century Australia Investments Limited, Incubator Capital Limited, Sporting Chance Cancer Foundation, the Australian Fund Managers Foundation, the Australian Children's Music Foundation and he is a Member of the Second Bite NSW Advisory Committee.